Beal, was a railroad station on the Atlantic and Pacific Railroad line between Needles, California and Topock, Arizona from 1889. It was located 5 miles north on the railroad line to Needles from Mellen. Today site of Beal is abandoned, with no visible ruins. 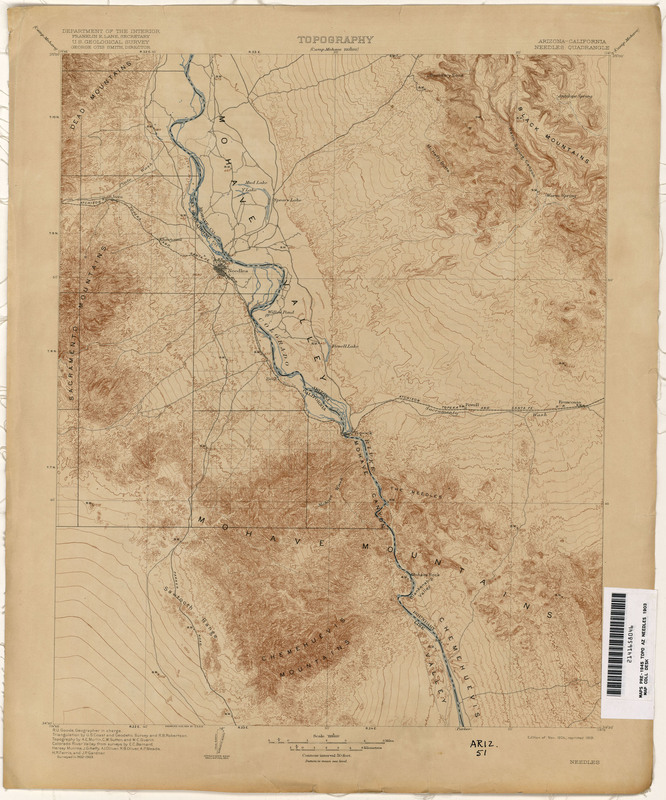 ^ Needles Quadrangle, Arizona, California, U. S. Geological Survey, Edition of 1904, reprinted 1919 from lib.utexas.edu accessed July 21, 2015. ^ Richard E. Lingenfelter, Steamboats on the Colorado River, 1852-1916, University of Arizona Press, Tucson, 1978 Archived January 18, 2016, at the Wayback Machine. Map of the 5th Operating Division of the Western Division, Atlantic & Pacific R.R., From Peach Springs to Needles. W.A. Drake, Acting Chief Engineer. Drawing No. J-2-902. from davidrumsey.com accessed July 20, 2015. This map was one of a set of six hand-drawn maps made in 1882 on semi-transparent waxed linen with some color, illustrating the route Lewis Kingman surveyed from Albuquerque to Needles. It was intended to be printed but never was, due possibly to the problems at the bridge at Eastbridge, shown on this map, from 1884 to 1890. Map of the 6th Operating Division of the Western Division, Atlantic & Pacific R.R., From Needles to Mojave. Saml. M. Rowe, Resident Engineer. Drawing No. J-2-902, 1882 from davidrumsey.com accessed July 20, 2015. This map was one of a set of six hand-drawn maps made in 1882 on semi-transparent waxed linen with some color, illustrating the route Lewis Kingman surveyed from Albuquerque to Needles. It was intended to be printed but never was, due possibly to the problems at the bridge and station at Eastbridge which was abandoned in 1890, shown on this map that shows the change of route south along the west bank to Beal, and to that new bridge at Mellen and the abandoned station Powell that can be seen partially erased on the map.